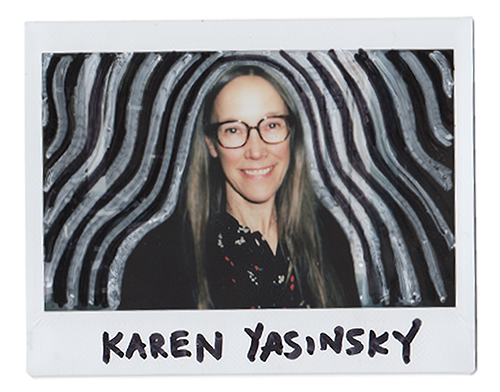 Karen Yasinsky is an instructor at Johns Hopkins University. She is artist and filmmaker working with experimental film, animation and drawing. Yaskinsky is a Guggenheim fellow, an American Academy in Berlin fellow, and an American Academy in Rome fellow. Her video installations and drawings have been shown in many venues internationally including the Mori Art Museum, Tokyo, P.S. 1 Contemporary Art, NY, UCLA Hammer Museum, LA, the Wexner Center, Columbus, Kunst Werke, Berlin, and Museum Folkwang, Essen. Her films and videos have been screened worldwide at various venues and film festivals including Museum of Modern Art, the New York Film Festivals Views from the Avant Garde, the International Film Festival Rotterdam, Images Festival, San Francisco International, Crossroads and the Ann Arbor Film Festival (Best Sound 2013). She is also the recipient of the Baker Award.